When a vehicle is said to have independent suspension it means that the suspension system is set up in such a way as to allow the wheels on the left and right side of the vehicle to move vertically independently of each other while driving on uneven surfaces. This is achieved by not directly connecting the wheels together on a rigid axle or chassis. In my suspension webpage I described the vehicle suspension and how it functions but in earlier automotive engineering and even in some vehicles today the suspension was attached directly to the chassis or axle. This caused the movement of one wheel to affect the wheel on the other side as the entire axle or frame moves and the other wheel will also move, not as much as the initial wheel in most cases but it still moves. The camber of the wheel changes temporarily as the other wheel moves or it can also have a vertical movement. This can also cause the body of the vehicle to rock side to side or be subjected to a slight body roll. To achieve the independence the rigid axle or a rigid sub frame is still used but the shock absorber is not rigidly attached on both ends. Instead one or two links attached to the rigid axle or frame and the wheel and these links has the ability to pivot. The shock absorber is then attached to one of the flexible links and the rigid frame or to both of the flexible links. As the vehicle travels over rough roads the shock absorber and flexible links on one wheel or of one side can move vertically to adapt to the rough roads while the rest of the vehicle remains undisturbed. A vehicle can have independent front suspension, independent rear suspension or front and rear independent suspension. Independent front suspension is much more common than independent rear suspension but a true high end vehicle should have independent suspension at the four corners. Two common designs for independent front suspension are the Wishbone double link and MacPherson strut. Independent front suspension is very common, the exceptions being heavy duty 4WD vehicles and heavy duty trucks. Common designs for independent rear suspension include the Wishbone double link and MacPherson strut, the parallel link system, the swinging arm and the transverse link. 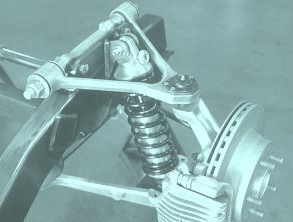 Image of a wishbone independent front suspension mounted to a sturdy frame. It is relatively easy to design an independent suspension for the non driven wheels of a vehicle but for the driven wheels the axles which is also attached to the wheels also has to move independently while rotating. This is achieved by using relatively lightweight axles and using constant velocity/universal joints to attach the axle to the wheel and the differential. The shock absorber is not attached to the axle but to the pivoting link that remains relatively parallel to that driven axle. Now imagine how a vehicle would ride and handle if a four wheel independent suspension system was added to magnetic suspension or air suspension.